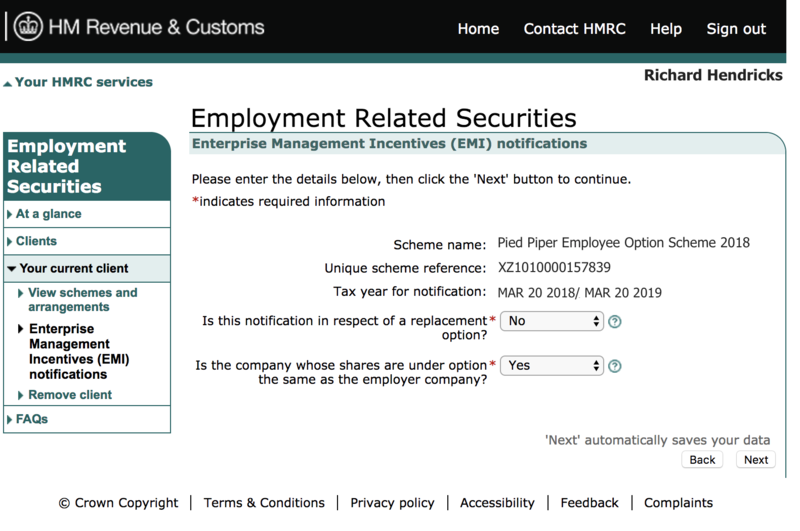 Every time your company issues a new grant as part of your EMI scheme, you need to notify HMRC through an EMI notification. 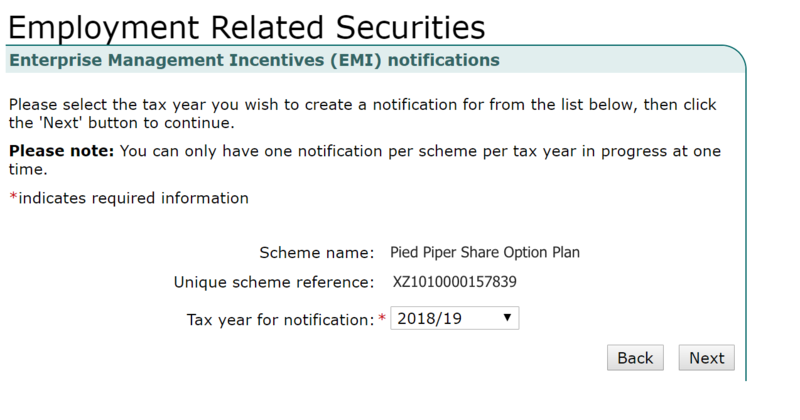 If you’ve used Capdesk before, you probably know by now that the platform can generate and automatically fill out an EMI notification for you. If not, take a brief look at our blogpost on that and come right back! Once your report is ready though, you’ll have to file it through the HMRC website, which can get quite complicated. But don’t worry, we’ve got you covered with step-by-step instructions. 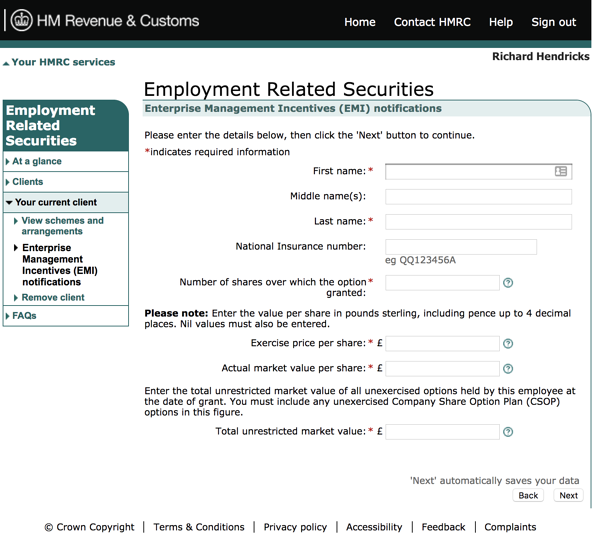 First, sign in to your company’s online HMRC account. If you don’t have an account, you’ll need to set one up. Note that you must register as a PAYE (Pay As You Earn) account. On the left-hand side bar, click ‘Enterprise Management Incentives (EMI) Notifications’. This will inform you that you have 92 days from the date of the grant issuance to complete the notification process. 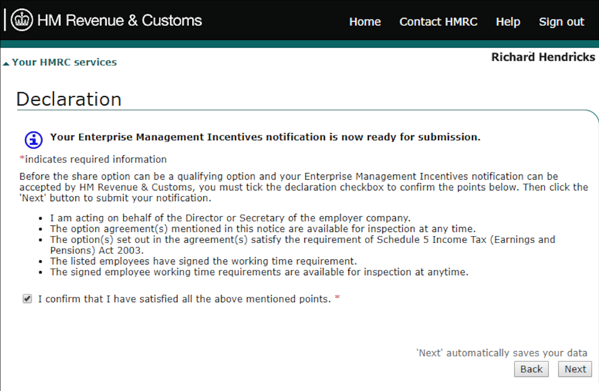 Next, click ‘Create an EMI Notification for [company name]’ at the bottom right. 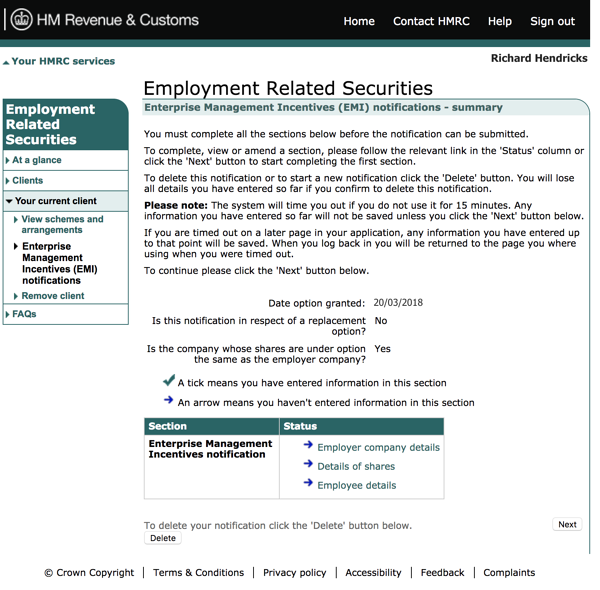 This will prompt you to enter a date for when your grants were issued, as shown below. Click ‘Next’. Now, you will be asked to pick ‘yes’ or ‘no’ from a drop-down bar to answer two questions about the nature of the options you are issuing. Select the answer that fits your circumstances. Click ‘Next’. The following page is the Notifications Summary page, which summarises the information you’ve input so far, but also asks you to fill out three additional sections, indicated by a small blue arrow symbol at the bottom of the display box. 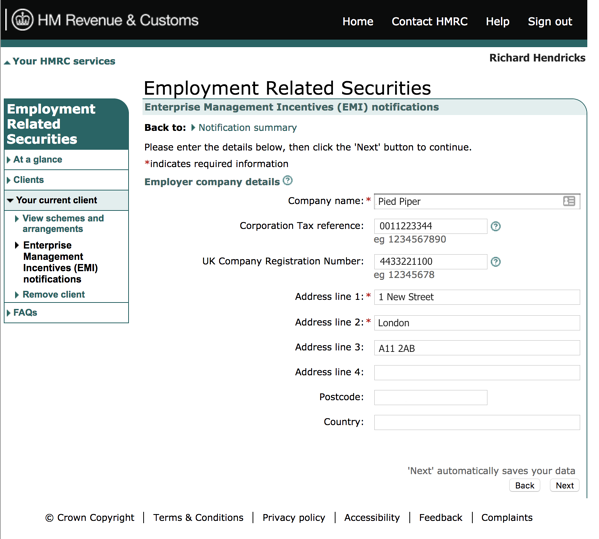 Click the first arrow, ‘Employer Company Details’. This will direct you to a page where you can fill out your company’s information. Now click ‘Back to Notification Summary’ at the top left of the display box. Then select the second blue arrow, ‘Details of Shares’. 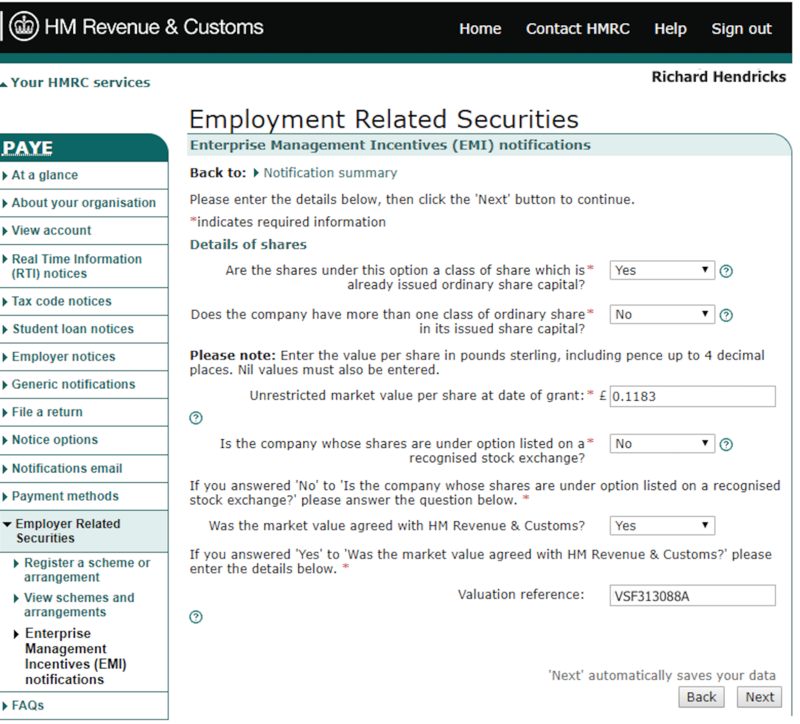 Here, you’ll have to provide information about the nature of the purpose and class of the shares issued, whether the company issues other share classes, the unrestricted market value of the shares, as well as whether or not this has been reviewed by HMRC. 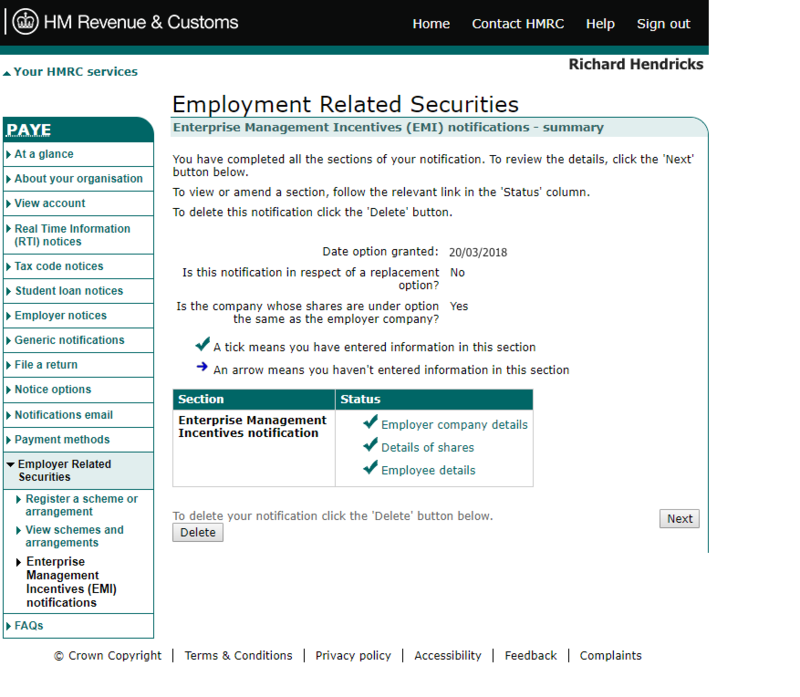 Back on the ‘Notification Summary’ page, select the final section, ‘Employee Details’. If you are not on Capdesk, you click 'Add Employee' to manually enter the grant recipient’s details in the form shown below. 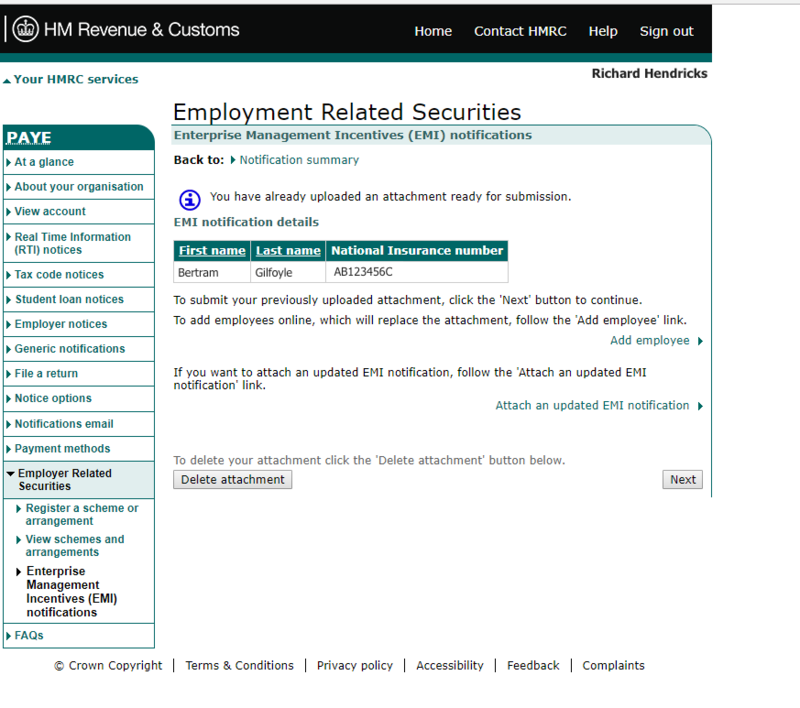 Alternatively, you can select ‘Download Form’ to receive the EMI notification form, which you will then need to fill out manually before uploading it again. If you are on Capdesk, things are much simpler. 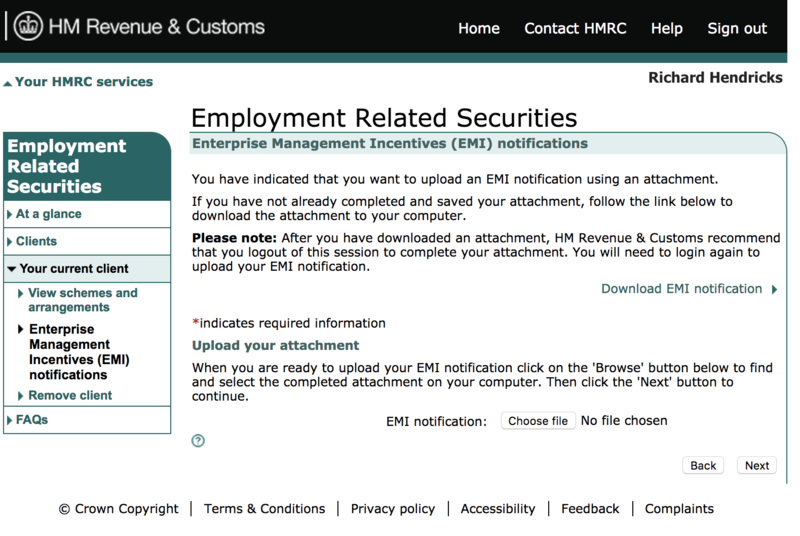 Just click ‘Upload attachment’ and submit the automatically filled EMI notification that you exported from the platform. 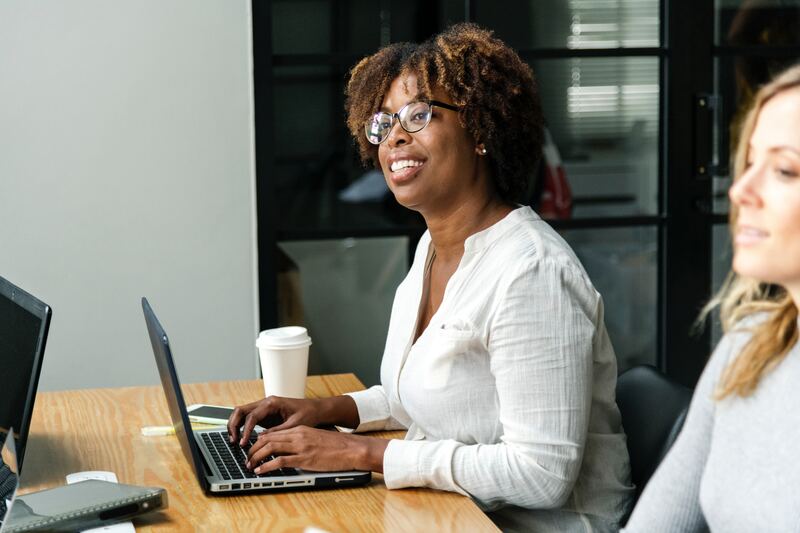 Either way, to upload a file you need to click on the 'choose file' button at the bottom of the display box, to search for the file you wish to submit. Once you complete this process, you will be able to review your actions before clicking ‘Next’ to confirm them. On this screen, you are also able to add another employee (click 'Add Employee') or update your current notification through the 'Attach an updated EMI notification' hyperlink. 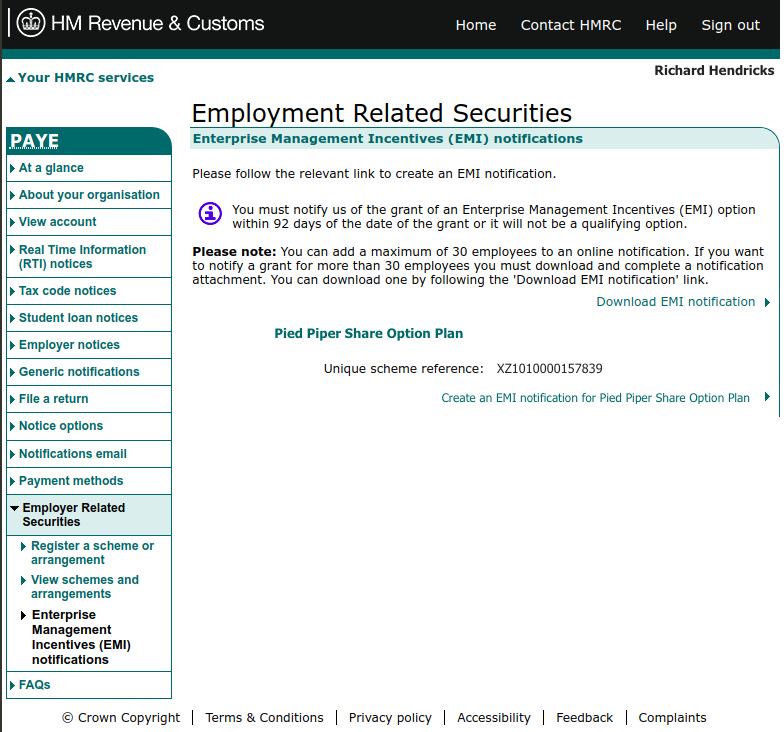 Once you have filled out this final section, you should be able to see on the Summary Page that all sections of the application are complete. If you need to make any changes, this is the last chance to do so. Then, click ‘Next’. 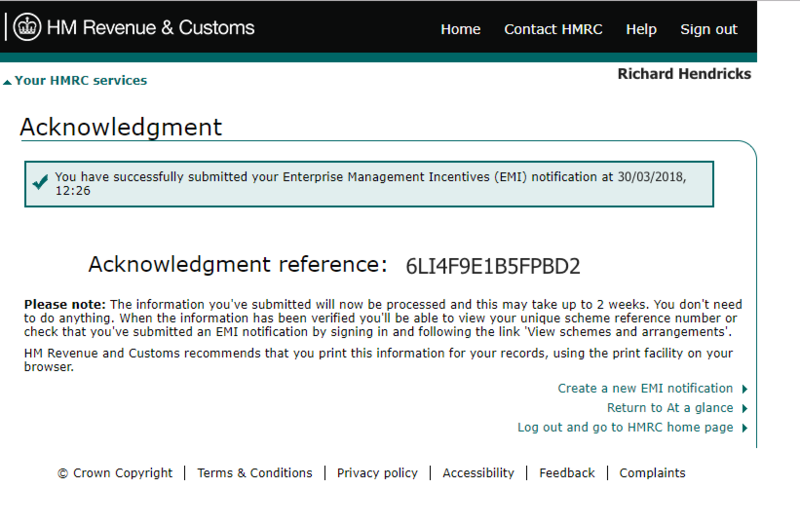 Finally, you will have to formally declare that your application meets the submission criteria by ticking the ‘I confirm’ box and then clicking ‘Next’. And that’s it! Your application is now submitted and you should receive a confirmation message as shown below. Hooray! 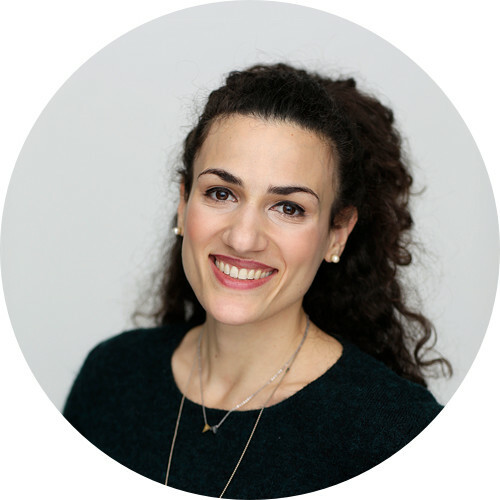 Anastasia holds an MSc in International Marketing, and is currently our Marketing Associate at Capdesk's London office.